Dr. Anas Al-Shaikh Ali, Academic Advisor, London Office, International Institute of Islamic Thought. For Services to Community Relations. 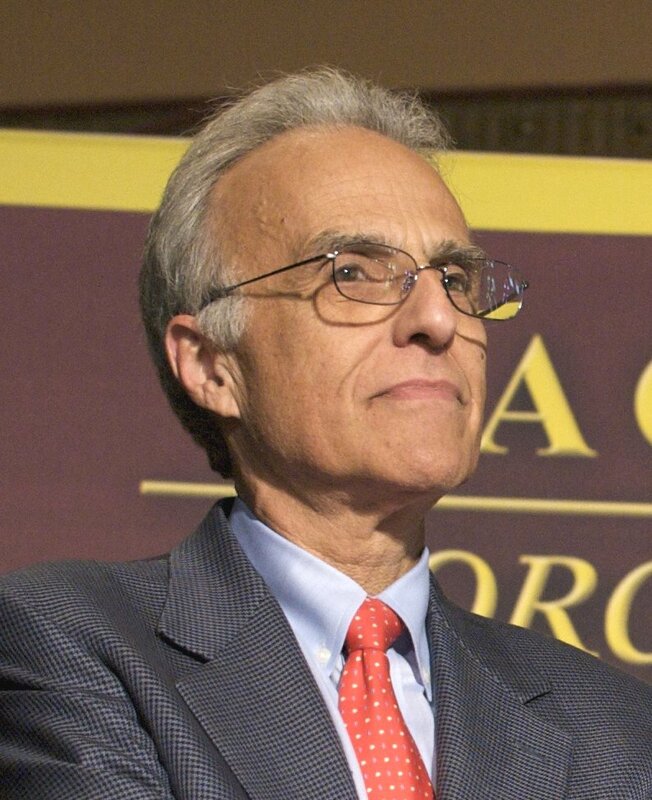 John Esposito and Professor Charles Butterworth. Click on name above to see award. The AMSS UK is pleased to announce that its prestigious Building Bridges Award for 2009 has been jointly given to the British Council, in recognition of the 'Our Shared Europe' project which seeks to generate awareness and better understanding of Muslim contributions to European culture and society; and to 1001 Inventions, in recognition of the notable contribution of the 1001 Inventions educational project to reveal the rich heritage that the Muslim community share with other communities in the UK, Europe and across the World. 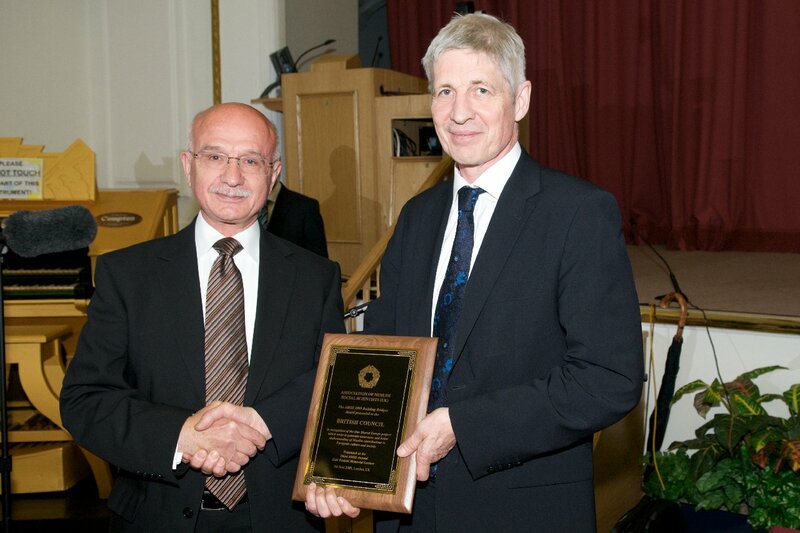 Both awards were presented during the third AMSS(UK) Annual Zaki Badawi Memorial Lecture held on 5th June 2009 at the University of Westminster, London, UK. Click here for awards page. 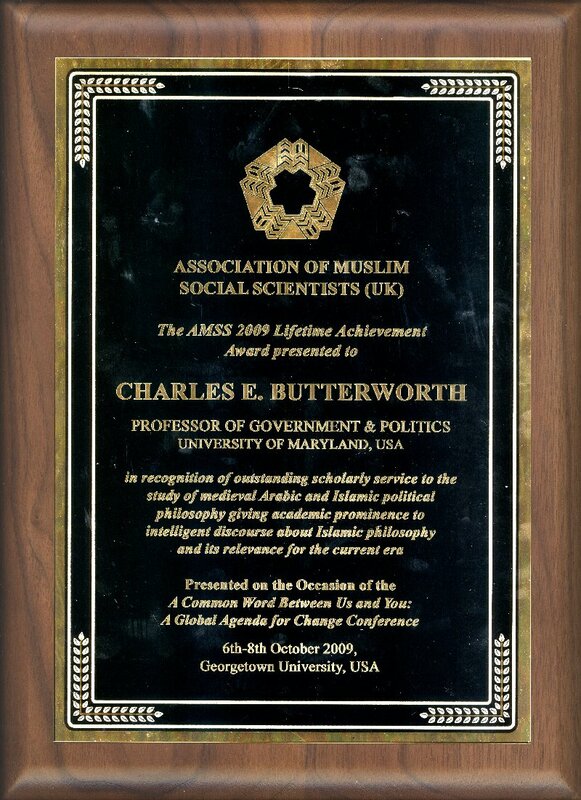 The AMSS UK is pleased to announce that its prestigious 2009 Lifetime Achievement Award has been presented to two recipients at the A Common Word Between Us and You: A Global Agenda for Change Conference, 6-8 October 2009 at the Prince Alwaleed Bin Talal Centre for Muslim-Christian Understanding, Georgetown University, USA. The Award was presented by Dr. Ibrahim Kalin, Chief Advisor to the Prime Minister of Turkey, and Shaikh Amr Khaled on behalf of Dr. Anas S. Al-Shaikh-Ali, CBE, Chair, AMSS UK. Click here for the Awards Press Release (pdf). Click here for awards page. 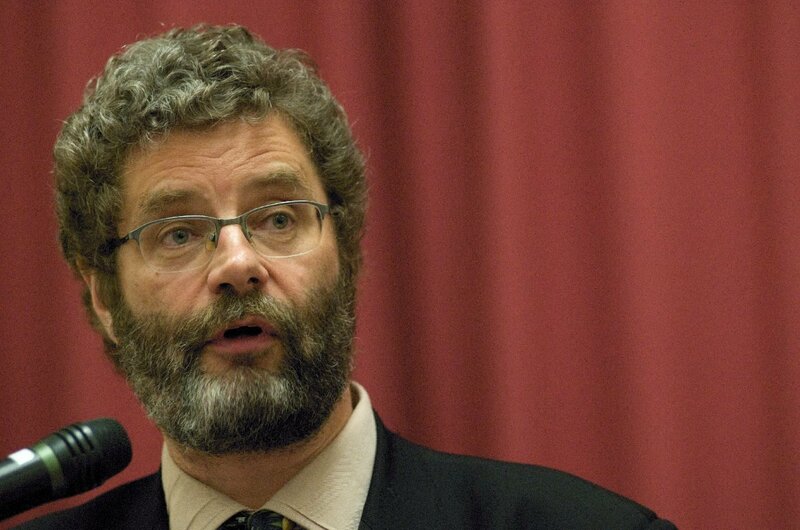 Chair, AMSS (UK), Academic Advisor, IIIT. 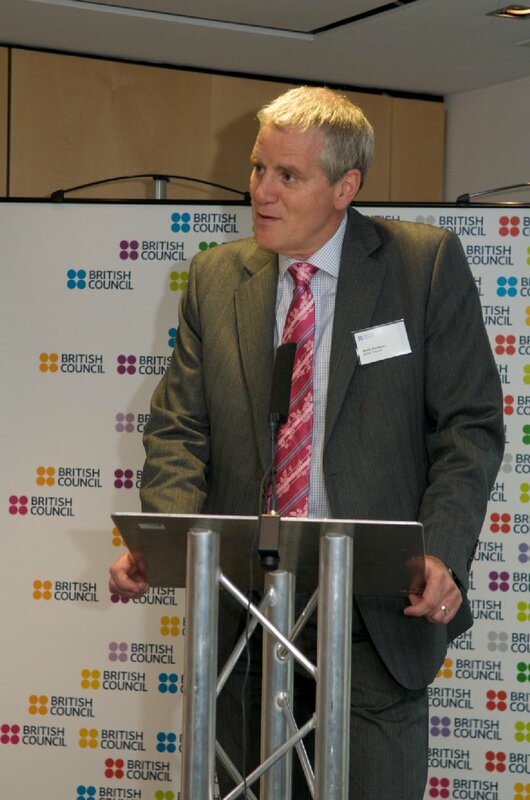 British Council Event, London, UK on 9th June 2009. Westminster on 5th June 2009. 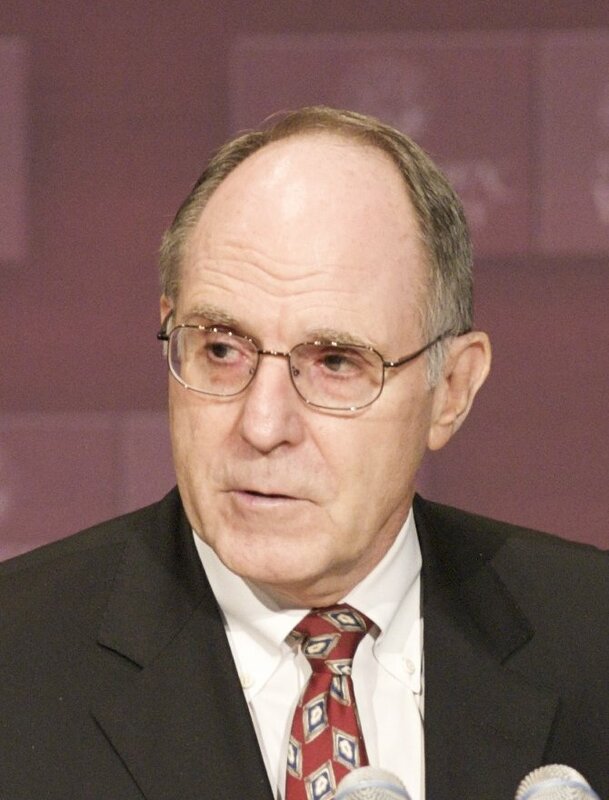 The Occasional Paper from this lecture is now available. Click her for more details. 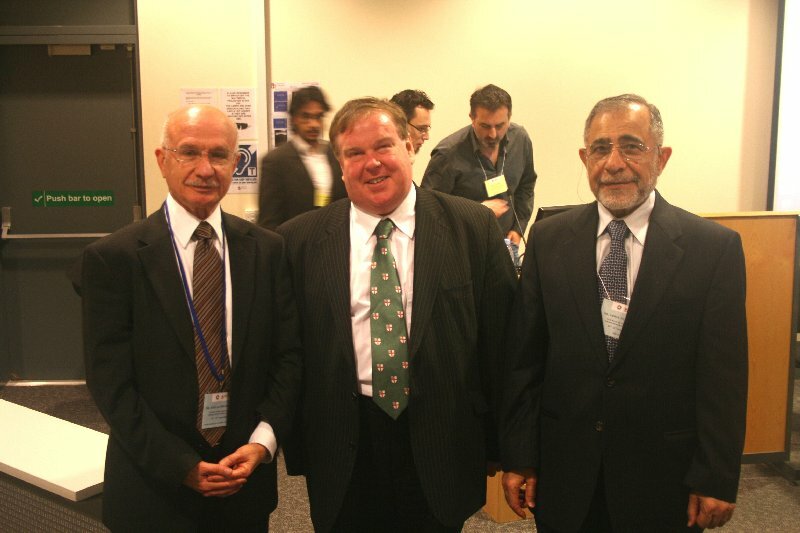 Third AMSS Annual Zaki Badawi Memorial Lecture delivered by Martin Rose at University of Westminster, UK on 5th June 2009.
behalf of 1001 Inventions - Muslim Heritage in Our World. 2009 Building Bridges Awards Jointly Presented to the British Council and 1001 Inventions. Muslim Youth Conference held at University of Chester, UK on 20-22 March 2009. I would like to welcome you to the website of the Association of Muslim Social Scientists (AMSS) UK. Here you will find information about our organisation, our publications and our events and conferences. 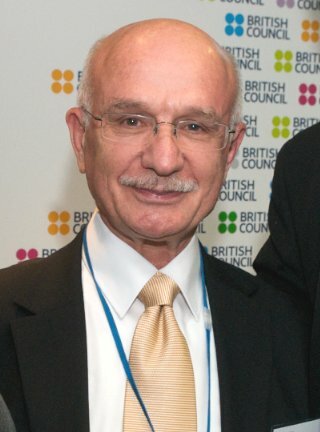 AMSS (UK) is dedicated to advancing Muslim scholarship; the promotion of the Islamic position in various academic disciplines; to keep Muslim scholars informed about current conceptual, methodological and analytical developments and promote greater interdisciplinary co-operation, in an effort towards generating informed, critical and creative Islamic alternatives and opinions on topical and emerging issues of academic relevance to Muslims. 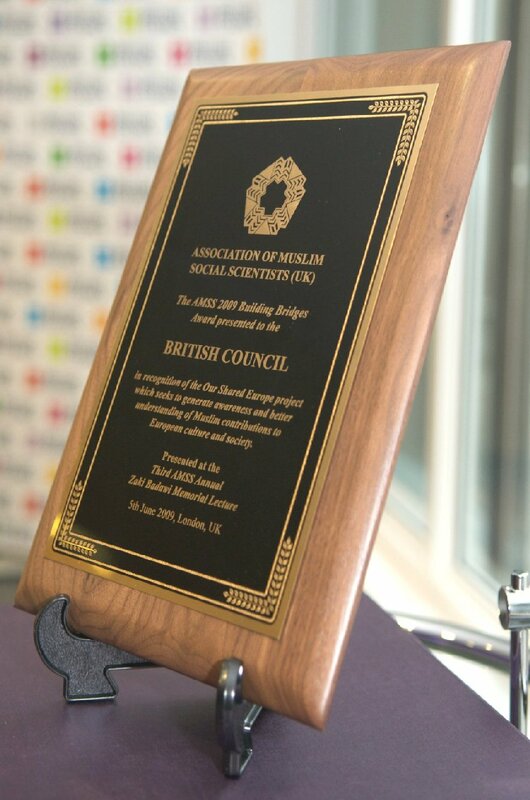 AMSS (UK) has introduced two prestigous awards, namely the Lifetime Achievement and Building Bridges awards, that are intended to recognise and highlight the achievement of individuals who have made a significant contribution to Islamic thought and promotion. We were honoured to award recent recipients: Dr Mustafa Ceric The Grand Mufti of Bosnia (pictured above); Dr Rowan Williams The Archbishop of Canterbury; and jointly award Recep Tayyip Erdogan The Prime Minister of Turkey and J.L. Rodriquez Zapatero The Prime Minister of Spain. 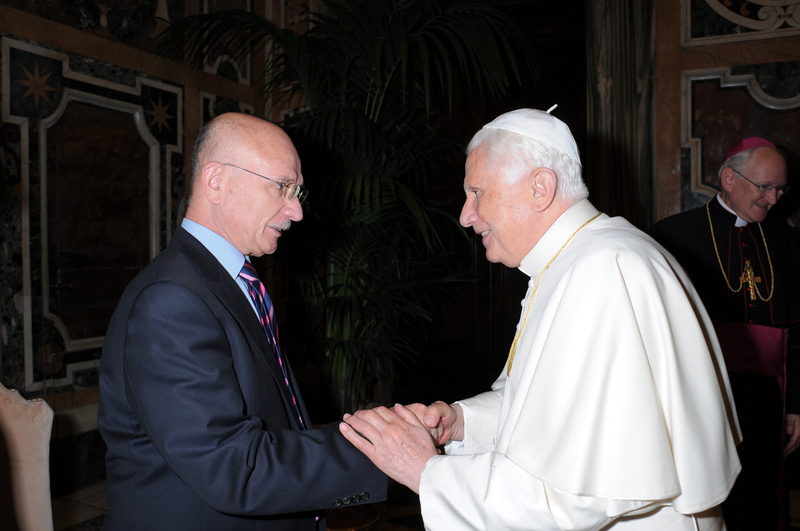 AMSS UK was honoured to participate in the recent A Common Word seminar which culminated in an audience with His Holiness Benedict XVI the Pope. The First Seminar of the Catholic-Muslim Forum was held in the Vatican Rome on 4-6 November 2008 and attended by 29 Muslim and 29 Christian scholars, including His Eminence Mustafa Ceric, the Grand Mufti of Bosnia. The Forum, speeches, and addresses by both His Eminence Mustafa Ceric and His Holiness Benedict XVI, called for mutual love and respect between Christians and Muslims to heal tension between the two faiths. See links below for more details. 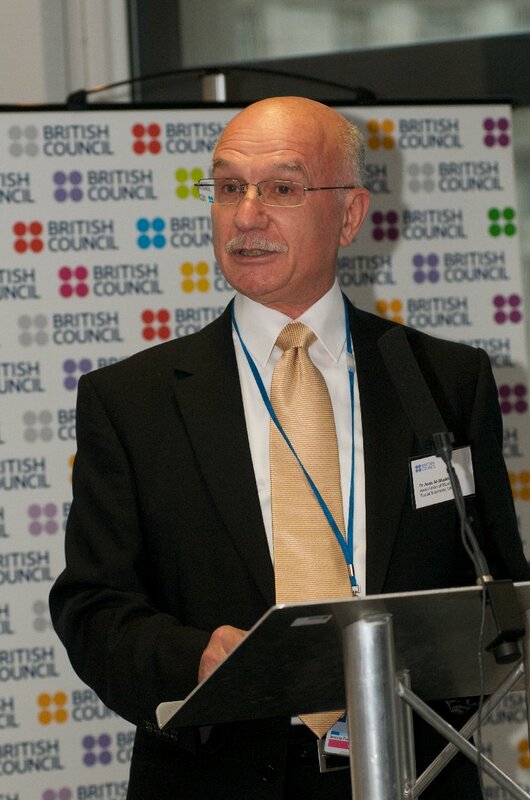 Speech delivered by Seyyed Hossein Nasr (external link). Address of His Eminence Mustafa Ceric, Grand Mufti of Bosnia (external link). Address of His Holiness Benedict XVI, the Pope (external link). Click here for BBC News article and video clip (external link). Click here for Vatican news article (external link). The AMSS UK is pleased to announce that its prestigious Building Bridges Award for 2009 has been jointly given to the British Council, in recognition of the 'Our Shared Europe' project which seeks to generate awareness and better understanding of Muslim contributions to European culture and society; and to 1001 Inventions, in recognition of the notable contribution of the 1001 Inventions educational project to reveal the rich heritage that the Muslim community share with other communities in the UK, Europe and across the World. 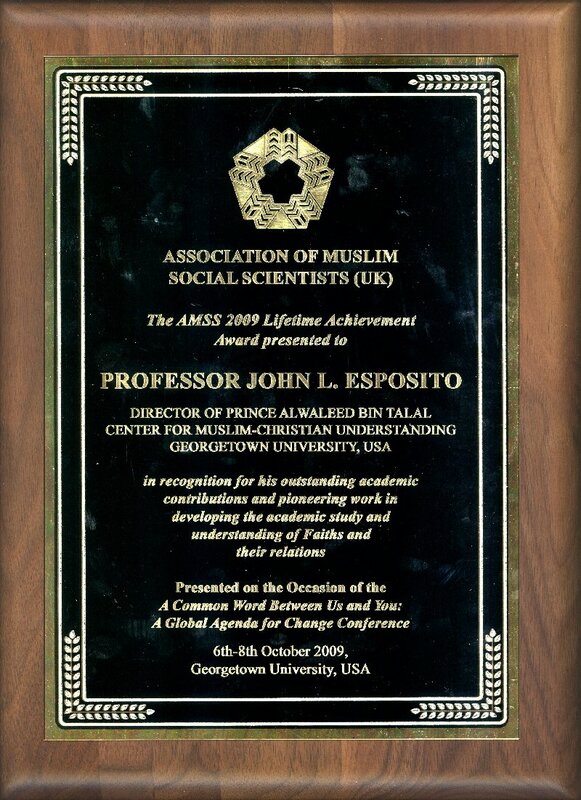 Both awards were presented during the third AMSS(UK) Annual Zaki Badawi Memorial Lecture held on 5th June 2009 at the University of Westminster, London, UK. Click here for awards pages. The AMSS UK and the University of Chester jointly organised a conference on Muslim Youth: Challenges, Opportunities & Expectations. The conference was held at the University of Chester, Chester, UK on 20-22 March 2009. More information on the conference themes, programme, sessions and lectures can be found in the Conference Briefing (pdf). Members will receive complimentary copies of A.J.I.S.S. (American Journal of Islamic Social Sciences) and (for those who know arabic) Islamiyat Al-Ma'rifah. Note that AMSS (UK) members and students are usually entitled to a discount for conference fees. If you are not a member already then how about joining today to get your discount for forthcoming conferences and also enjoy the other membership benefits as well. Click here for a printable membership form (PDF).